Late 16th- or early 17th-century French brown gilt calf, imiatating the style of Clovis Eve; in a blue marbled box. Marie Girard, 1608 (inscription on second flyleaf); William Harris Arnold (bookplate inside back cover, 1921); his sale (New York, Anderson Galleries, 10 November 1924, no. 450) to Wilbur Macey Stone of East Orange, New Jersey (his bookplate on first flyleaf recto); given by William V. Griffin or Charles Scribner to Mrs. Milton S. Dillon of Far Hills, New Jersey (neé Vera Maud Cushman; married Milton S. Dillon, who died in 1939; married Catesby L. Jones in 1946; later married Eric F. Kerry; died June 1, 1991); given by Mrs. Dillon to Mr. and Mrs. Sidney G. Dillon in early 1991. 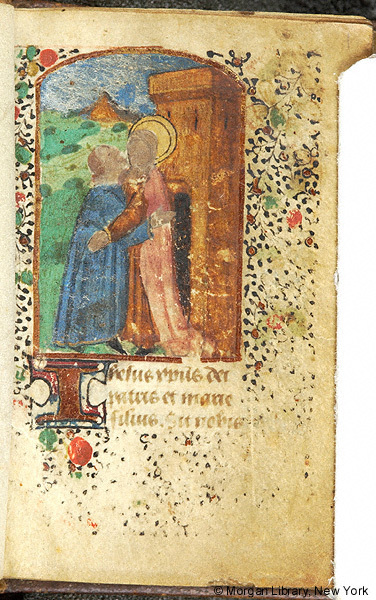 Ms. book of hours for the use of Rome; written and illuminated in France ca. 1460. Decoration: 7 miniatures; inside front cover, small engraving as pastedown: S. Madonna del Mondovi a Vico.